I am officially six months pregnant! How on earth did that happen so quickly?? 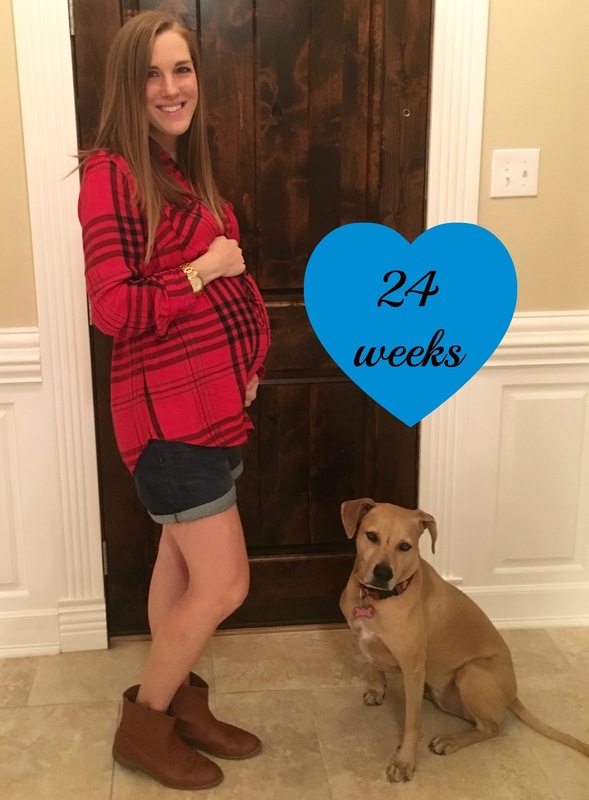 24 weeks is what doctors deem "viability week", so I am thankful to have reached that milestone and hope this little guy is comfortable and stays in for many more weeks to come. 1. I used to only have indigestion in the evenings, but this week it has been more consistent throughout the day. I don't really see this going away, so I am hanging in there and just trying not to overeat too much! 2. I keep forgetting how big my belly is and am constantly bumping it into things. Oops! 3. I am getting more and more easily out of breath. I am still power walking throughout the week and doing fine with that, but little things like walking up the stairs or pacing around while holding my nephew get me out of breath lately. I've never felt so out of shape! 4. Baby boy is most active at night when I lay down to go to sleep. I love those quiet moments of just laying there and feeling him move. It's the best! Congrats on making it six months! Definitely something to celebrate. I'm about eight weeks behind you with a baby boy of my own and have loved reading all of your updates. Ahh!!! He'll be here so soon!!!! Chelsea, I'm so excited for you! That sweet little boy is going to be so so loved! You are adorable! The last half of pregnancy flew by for me. You are adorable! And I love Jenny's face!